This polygon datalayer contains geographic boundaries of the United States Postal Service (USPS) five-digit ZIP Code areas within Massachusetts. MassGIS receives quarterly updates of these data as part of its license for the HERE core map release (streets and related data). These ZIP Code boundaries are aligned to the street centerlines of the Q2 2018 product and use a recent USPS source file. These ZIP Code boundaries are provided as delivered by HERE (with two minor edits by MassGIS, as discussed below). MassGIS makes no claims to the accuracy of the information in this file. These ZIP Code boundaries do not topologically align with MassGIS' Level 3 parcel data and are frequently revised and subject to change. These boundaries should not be confused with ZIP Code Tabulation Areas (ZCTA) provided by the U.S. Census Bureau. The layer is named ZIPCODES_NT_POLY. Five-digit ZIP Codes were developed by the USPS and first introduced in 1963 for efficient mail delivery (the term ZIP stands for Zone Improvement Plan) but are difficult to map with complete certainty. In most cases, addresses in close proximity to each other are grouped in the same ZIP Code, which gives the appearance that ZIP Codes are defined by a clear geographic boundary. However, even when ZIP Codes appear to be geographically grouped, a clear ZIP Code boundary cannot always be drawn because ZIP Codes are only assigned to a point of delivery and not the spaces between delivery points. In areas without a regular postal route or no mail delivery, ZIP Codes may not be defined or have unclear boundaries. Numerous ZIP Code areas contain multiple named communities within them, particularly in rural areas, and in urban regions, single large communities encompass multiple ZIP Codes. ZIP Code and community boundaries frequently do not correspond or correspond only roughly. Also, many communities for which the ZIP Code area is named are not incorporated, which means they do not have legal boundaries. The USPS does not maintain an official ZIP Code map. The Census Bureau and many other commercial services will interpolate the data to create polygons to represent the approximate area covered by a ZIP code, but none of these maps are official or entirely accurate. 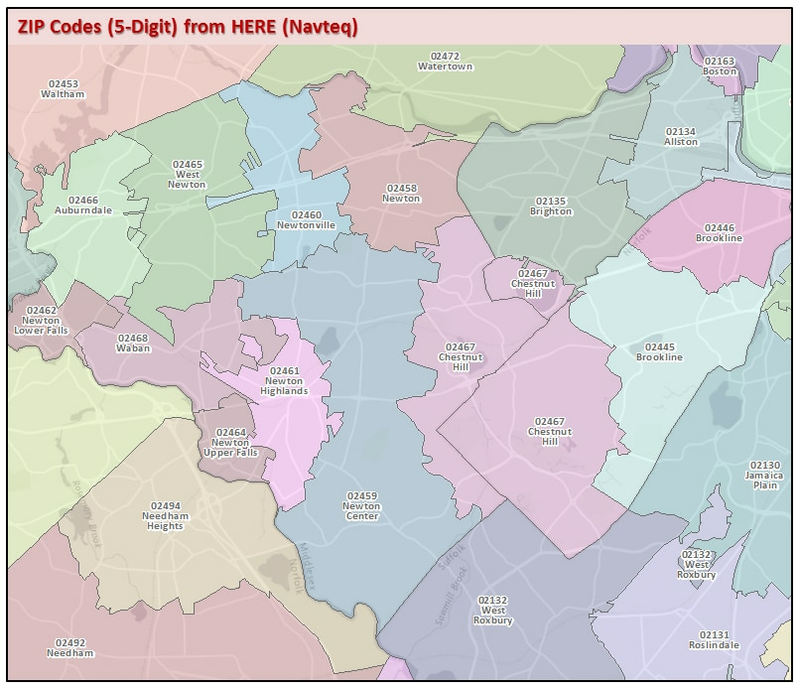 Please see http://www.unitedstateszipcodes.org/ for a good discussion of the issues of mapping ZIP Codes. HERE (the company that now includes data products that were formerly branded as "Navteq") maintains several versions of postal code data. The version distributed by MassGIS is an extract of HERE's nationwide "Un-generalized, High Definition, with County" layer. Relative to HERE's standard Postal Code Boundaries product, a significant amount of line work was created for this HD version to better segregate delivery to adjacent ZIP codes. The HERE Map line work was still used as much as possible. Boundaries have increased detail to more closely reflect postal code delivery. In this HD version, multi-part ZIP Code boundaries are allowed more often, when needed to reflect non-contiguous postal delivery. This dataset displays water features on coastlines but does not include "holes" for inland water bodies, and includes ZIP Code boundaries split at county boundaries. The HERE Postal Code Boundaries product does not have void areas in postal coverage, even if such non-delivery areas exist in reality (such as a remote mountainous area). This is by design, for aesthetic purposes and to ensure that a postal code is assigned to all geographic areas. MassGIS made minor edits to a few ZIP Code boundaries in Boston based on address point data from the city. MassGIS also projected the data into the Massachusetts State Plane Mainland coordinate system. AREA_SQMI Area of polygon in square miles. After the 2018 Q2 delivery, MassGIS ended its working relationship with HERE and will explore other ways of maintaining a ZIP Code layer.